Email retargeting, remarketing, and triggered email campaigns are some of the top performing tools for ecommerce marketers. They have evolved over the last decade and now include elements of performance marketing, as you can use them for prospective and noCRM audiences, as well as for subscribers. They most commonly target lower-funnel activities — with abandoned cart and abandoned product browse campaigns — and provide an opportunity for website visitors to reconnect with products that have caught their attention. As we move into 2019, we’ll review the basics, explore the advanced tactics, and provide eCommerce marketers with everything you need to drive increased ROI on your marketing budget, year over year. 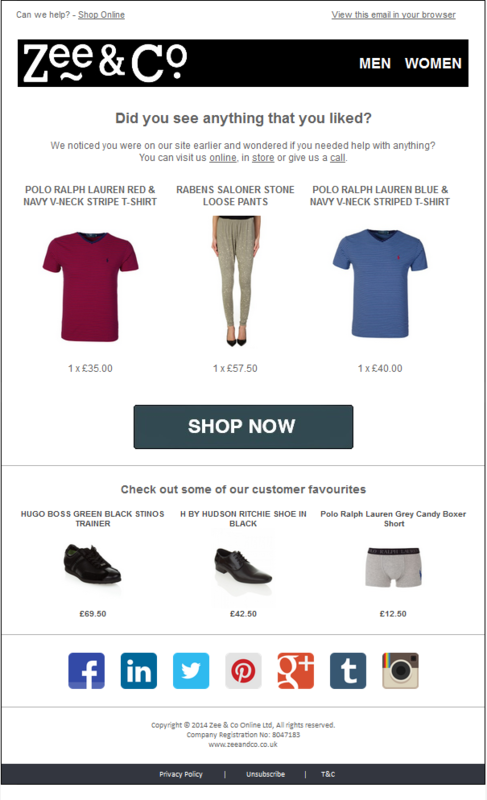 Email retargeting (AKA retargeted ads) – You’ve got subscribers and previous customers. You use their email addresses to target them with ads via facebook, google, or a DMP and other data partners. Also called “list-based retargeting”. Once you’ve “onboarded” your data, you can re-identify them when they visit your site, and retarget them with an ad. Email retargeting (AKA email remarketing, triggered email) – When your previous customers (or subscribers) come back to your website, sometimes you can recognize them via a login or cookie. This allows you to send a trigger-based email campaign (such as an abandoned cart campaign). This is usually called “email remarketing”. Email retargeting (AKA noCRM email retargeting, prospective email retargeting, performance email, triggered email) – Using email to target either a) prospective visitors who you don’t yet have an email address for, or b) unidentified visitors who are on your email list, but you don’t have a recent cookie for (so you can’t tie them to their email address). Your goal with this program is to target the >90% of visitors who you don’t recognize, with your highest-converting marketing campaigns: email. BouncePilot is the leader in this space. For those unfamiliar, noCRM email retargeting is a technology that allows marketers to send retargeting emails to anonymous website visitors based on their actions on a site, a) without collecting their email or b) who you can’t identify via cookie or other person-based ID. Considering 90%+ of website visitors don’t leave their email address but do view products and abandon carts, the demand for this form of retargeting is self-evident. noCRM email retargeting allows marketers to reach more people from this large group, with emails that are relevant, timely, and have appropriate opt-ins. noCRM email retargeting works by matching visitors against a database of hundreds of millions of email addresses that have opted-in via partners and publishers. Email retargeting performs best when combined with the known behavior of site visitors. People who are re-targeted after abandonment have a 26% chance of returning to a site to complete their purchase. This impressive conversion rate is accomplished by aligning the behavior of site visitors and information on where they are in the buyer’s journey, or “funnel”. Retargeting combines a marketers’ knowledge of a customer’s level of interest with the best approach for converting that interest into a purchase. As a rule of thumb: The more relevant your retargeting emails are to the interests of site visitors, the more successful your retargeting campaigns will be. Here are some of the most common email retargeting strategies being used by marketers today. The abandoned cart email series is a highly effective email retargeting strategy which harnesses one of the most powerful forces of the natural world: non-buyer’s remorse. By sending abandoned cart emails following a drop-off, you can ask shoppers to reconsider the product they almost bought after they’ve had a little time to think about their decision. As a standard, approximately 10% of visitors create shopping carts. 3% purchase. The goal here is to incentivize the 7% of visitors who add your products to their cart but do not complete their purchase. By retargeting abandoned audiences with actions last taken on your website, you effectively get a second chance to entice a purchase with highly segmented content. Learn more: Check out BouncePilot’s “How To Build A High-Converting Abandoned Cart Recovery Email Series” guide to create effective abandoned cart campaigns. This retargeting strategy targets your mid-funnel audience: those who browse specific products, but have not added anything to their cart. These leads need more convincing than people who have already added products their cart. Your emails will need to outline several key reasons to choose your product over a competitor’s. Consider sending a set of products that were viewed, and always recommend items based on a visitor’s individual behavior. Coming soon: BouncePilot’s “How To Design An Abandoned Product Browse Email” guide for tips & tricks on how to create and optimize your campaign. Abandoned search & category emails help you reach people who browse category listings or use the search box on your website. These people already trust your brand enough to use your site for research, even if they aren’t ready to buy yet. Abandoned search emails are especially effective in the travel industry. Travelers routinely use airline and hotel booking sites to conduct multiple searches before choosing a final travel plan. 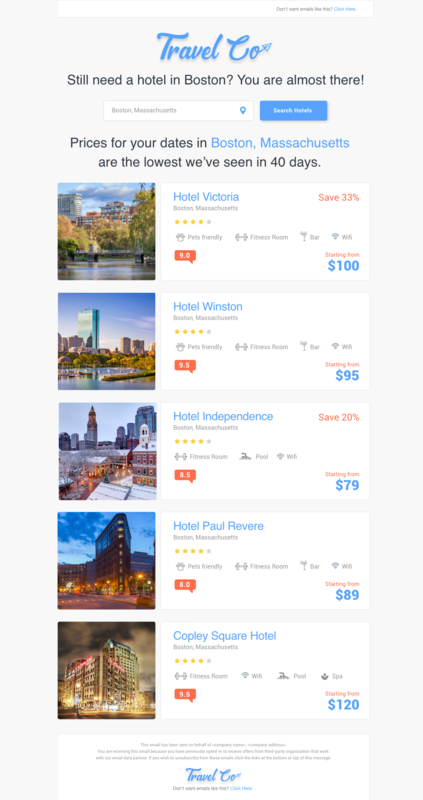 By showing prospective travelers the travel arrangements they were searching, these retargeting campaigns make it easy to book a flight or hotel in question. Learn More: Take a look at BouncePilot’s “Tips and Examples for Travel Industry Email Retargeting”. When a visitor simply lands on a homepage or inbound link which is not a product page, you may want to retarget them with a branding campaign, or specific campaign relevant to that page. This audience is still in the consideration stage of their buyer’s journey so the content they receive will be more general than abandoned cart or abandoned product browse emails. They’re often more about branding than driving a purchase. Unlike site visitors that trigger an abandoned product browse or an abandoned cart email, website page visitors want to know more about types of products or the company itself. These best practices will help you as you create retargeted email campaigns for site visitors, product browsers and people who abandon carts. Every time you contact your visitors, you should present them with something that is valuable to them. This increases the % of emails they open from you, and keeps them engaged. “How can I deliver real value”, you ask? Do your best to present people with products they are interested in. 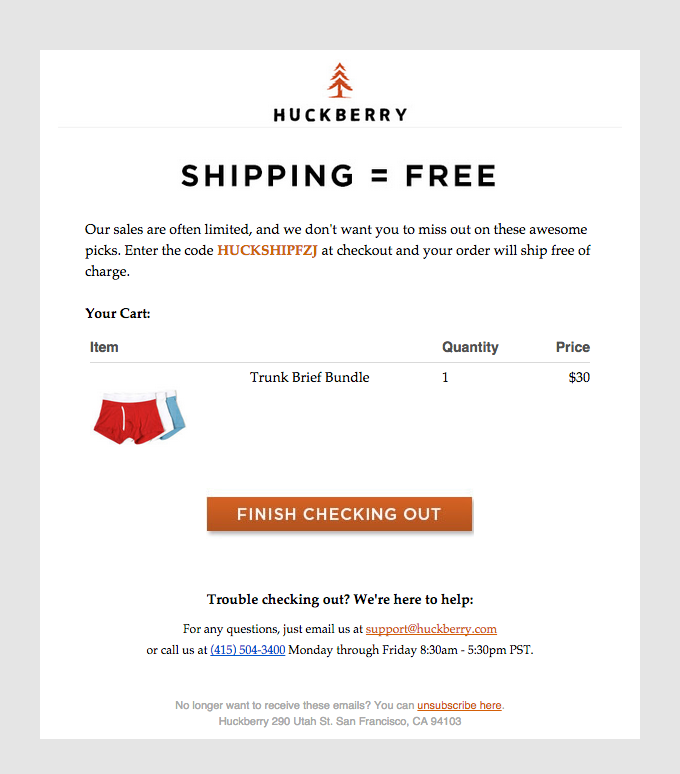 This is easy with abandoned cart emails, but if a site visitor viewed multiple products, think about which product is most likely to convert them into a new customer. You should never send an abandoned product browse email containing every product that someone viewed on a site, unless they only viewed a few products. Always limit the number of products you present in retargeting emails to a maximum of 3-5 items. This way, your emails feel personalized and your content is relevant. You’ll also want to think about the image to text ratio that helps ensure your email deliverability. MailChimp recommends 80% text, 20% images. Marketers want to get the right message to the right person at the right time.This is especially true for retargeting. The best time to send retargeted emails will always be determined by the actions that a site visitor has taken. For instance, abandoned cart emails are most effective when sent either within a few minutes (to catch people who are still shopping) or at least within a few hours of someone abandoning their cart. This way, when you reach out to them (with free shipping, a discount or another incentive to buy) they can satisfy their non-buyer’s remorse and know they are getting a good deal on their purchase. People who abandoned a web page, on the other hand, aren’t nearly as invested in buying the product.You can wait a day or two to email them, with more of an informational or branding approach than your abandoned cart emails. While personalization is a winning strategy, remember that you will not be able to get as personal with noCRM visitors as with your subscribed audience (eg: it’s best to address a visitor by First Name when they’ve subscribed, but avoid that for noCRM audiences). Each campaign (cart abandon, product browse, page visit, etc.) needs to be personalized according to the behavior of the site visitor, and presented in a way that is most likely to make them convert back into a site visitor and even into a new customer. For more information, take a look at ways to personalize subject lines to increase open rates, ideas for email retargeting in the travel vertical, and best practices for abandoned cart emails. Social proof is unbiased evidence that the product you are selling is beloved by your customers. Social proof comes in the form of online reviews from customers, testimonials, case studies and content created by online influencers, fans or customers. Social proof works because 85% of consumers trust online reviews as much as personal recommendations, so don’t miss an opportunity to provide people with social proof of a product’s quality in your emails. All of this content can be pulled directly from your site and added into your email campaigns quite easily. If you’re retargeting, it means that whatever incentive you have on your site, is not enough to entice an immediate purchase. This may be your last chance to get the sale, particularly when targeting prospective, first-time customers, so give them an enticing incentive. Think about lifetime customer value when creating your incentive offer. 60% of shoppers abandon cart because of high extra costs (shipping, taxes, etc.). By giving them an unexpected discount, you can help lower the price point that caused the pain that caused them to abandon the cart. In fact, 54% of shoppers will purchase products left in shopping carts, if those products are offered at a lower price, so don’t miss this opportunity to drive conversion rates with the help of additional discounts or value. 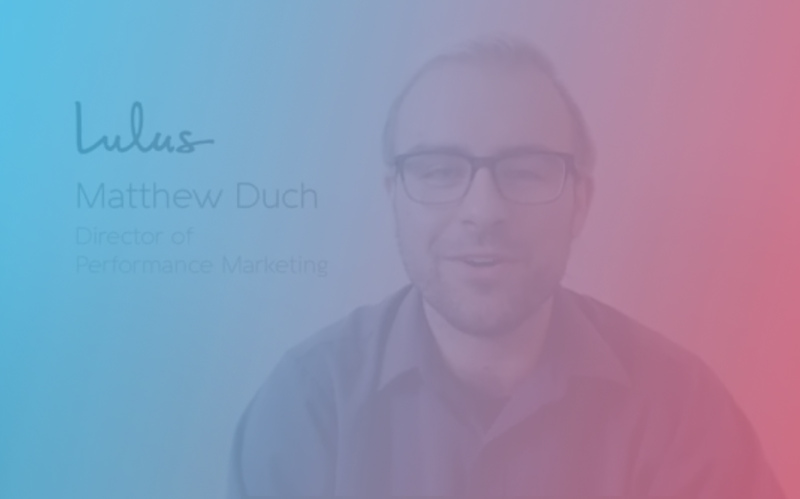 What metrics are the most important in email retargeting? Purchase Conversion Rates – What % of your visitors purchase on your site in general? What % purchase after receiving a retargeted email? Track this metric on a per-campaign basis, and remember, sometimes visitors start in an abandoned product browse campaign and complete their purchase after an abandoned cart campaign. There may be multiple campaigns involved. Return on Investment – Measure the cost of creating your triggered email campaigns, the tech involved in delivering them, and the human time involved in optimizing them. You’ll find that these campaigns will deliver some of the highest ROI of any marketing you do. Return on Email Spend – For your prospective email or noCRM campaigns, think of them as performance marketing campaigns. These campaigns will drive measurable purchases, noted through Last Click Attribution, as well as additional brand awareness, as tracked through clicks, site visits, and purchases in near-last-click sessions. Ideally, you’re tying all of your visitor data together to your own identity graph – but that’s a conversation for another day. Email Open rates – Highly dependent on your subject line, you should see >30% open rates for your abandoned cart emails, >20% for your abandoned product browse, and >15% for your other emails. If you’re looking to improve your open rates, take a look at How to Increase Open Rates with Better Subject Lines. Email Click to Open Rates (CTOR) – CTOR is calculated as # of clicks divided by # of email OPENS. It looks specifically at the effectiveness of your creative and your Call To Action (CTA). You should aim for >20% CTOR with all of your retargeting emails. Email Click Through Rates (CTR) – CTR is calculated as # of clicks divided by # of emails delivered. This measures your overall email effectiveness. If you’ve got a 20% Open Rate and a 20% CTOR, then you’ll have a 4% CTR. Head to Head Incentive Comparison: Conversion rate for campaigns with offers vs. campaigns without – This metric shows you how effective discounts, free shipping and other offers are for converting customers, and the ROI you are receiving from offering discounts in retargeted campaigns. Here are some other posts we wrote that can help you learn more about effective email retargeting.